The Men's Indoor AGM is on Tuesday 23 April at 7.30pm prompt. All members are requested to attend. Order your New Jacket or Gilet NOW! 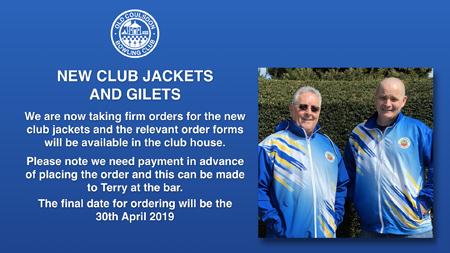 We are taking orders for the new club jacket. Get your order in before April 30th 2019. 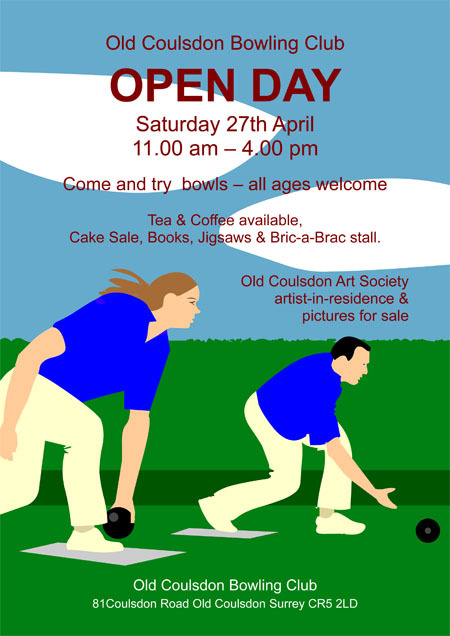 Old Coulsdon Bowling Club is hosting an OPEN DAY on Saturday 27th April, from 11.00 am to 4.00 pm. All ages are welcome to come along and try their hand at bowls. There will be cakes, jigsaw puzzles and books on sale plus a bric-a-brac stall. In addition, we are very pleased to welcome Old Coulsdon Art Society, who will have an artist-in-residence and pictures for sale. 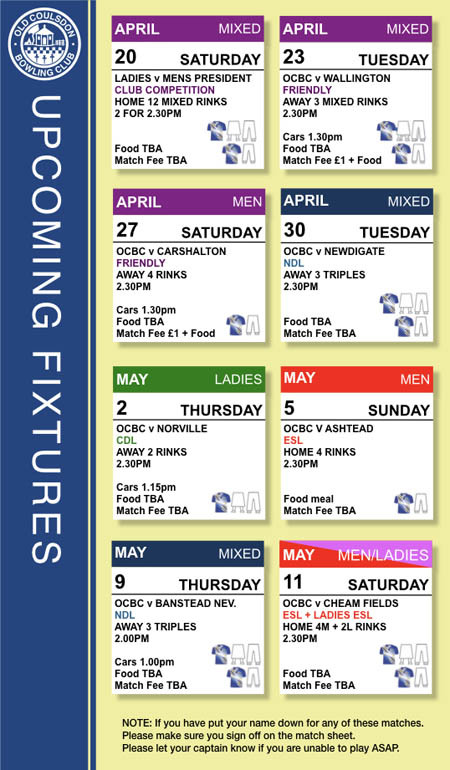 Outdoor Season - Open for Business! Before you sue for divorce on the grounds of desertion, consider this: is your partner a member of the OCBC Premises and Safety team? If so, their absence is due to the hours they have been putting in working hard outdoors throughout the whole indoor season. If not, get yourself a good lawyer. Seriously, our team has planned and implemented extensive change to the buildings on the top green. 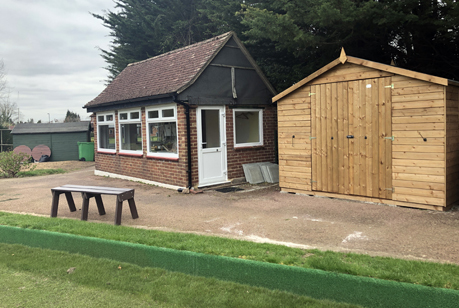 The old equipment store has been demolished and a new one erected. 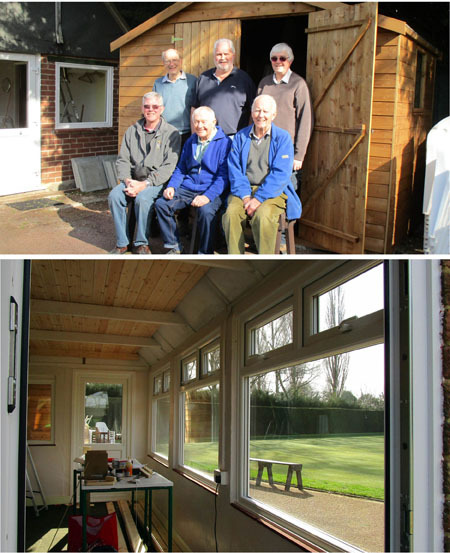 New double-glazed windows and doors have been installed in the pavilion and the team have put in a new wooden ceiling and new flooring. For those who haven’t been up to the top green recently, the hedging, which was planted to replace the fire damaged yews, is now established and well on the way to filling the gap; another job undertaken by the Premises and Safety team. 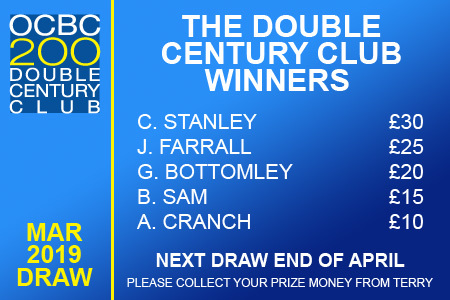 Well done team and thank you for all the work you do on behalf of Club members.